The planning system doesn’t just fail to provide homes. There are clear lessons to be learned from the unstructured and inadequate approach that successive governments have applied to securing appropriate strategic rail freight interchange developments (SRFIs, in the jargon) to serve London and the south east. That approach has now wasted decades without a spade in the ground, despite millions of pounds having been spent, countless inquiries and High Court proceedings and no doubt a lifetime of worry for those potentially affected. The difficulties with SRFIs also illustrate that the problems aren’t over even when planning consent is obtained – issues of commercial viability and land control are as fundamental. This blog post summarises where the three leading contenders have reached: Goodman’s Colnbrook Slough scheme, Helioslough’s former Radlett Aerodrome scheme and Roxhill’s Howbury Park scheme, all in the green belt. It is a long story but that’s why I have tried to tell it. An SFRI is defined in the Government’s National Networks national policy statement January 2015 as a “large multi-purpose rail freight interchange and distribution centre linked into both the rail and trunk road system. It has rail-served warehousing and container handling facilities and may also include manufacturing and processing activities”. What is the consenting process? If the proposal falls within the criteria in section 26 of the Planning Act 2008 (eg a site area of at least 60 hectares, to be connected to national rail network and capable of handling (a) consignments of goods from more than one consignor and to more than one consignee, and (b) at least four goods trains a day), it falls under the NSIP procedure. The only SRFIs so far consented as NSIPs have been Prologis’ Daventry International Rail Freight Terminal (3 July 2014) and Roxhill’s East Midlands Gateway Rail Freight Interchange (12 January 2016) (the latter against the examining authority’s recommendations). Goodman’s East Midlands Intermodal Park, Roxhill’s Northampton Gateway Rail Freight Interchange, Ashfield Land’s Rail Central Strategic Rail Freight Interchange (also Northampton) and Four Ashes’ West Midlands Interchange are all at pre-application stage. An NSIP can of course include associated development. There can be uncertainties as to the extent of warehousing that is justified and the degree to which commitments are to be given as to its rail-connectedness. For applications made from 6 April 2017, up to around 500 homes may also be included (see section 160 of the Housing and Planning Act 2016 and the Government’s March 2017 guidance). If the proposal doesn’t meet the NSIP criteria, it will need to proceed by way of a traditional planning application. The NSIP process has its pros and cons. It is interesting to note that the three schemes we will be looking at in this blog post have been proceeding by way of a planning application, with the site areas of the Colnbrook and Howbury Park schemes being 58.7 hectares and 57.4 hectares respectively (given an NSIP threshold of 60 hectares that looks like a deliberate “serve and avoid” to me…) and with the Radlett application process having predated the switching on of the 2008 Act. “2.53 The Government’s vision for transport is for a low carbon sustainable transport system that is an engine for economic growth, but is also safer and improves the quality of life in our communities. The Government therefore believes it is important to facilitate the development of the intermodal rail freight industry. The transfer of freight from road to rail has an important part to play in a low carbon economy and in helping to address climate change. 2.54 To facilitate this modal transfer, a network of SRFIs is needed across the regions, to serve regional, sub-regional and cross-regional markets. In all cases it is essential that these have good connectivity with both the road and rail networks, in particular the strategic rail freight network (see maps at Annex C). The enhanced connectivity provided by a network of SRFIs should, in turn, provide improved trading links with our European neighbours and improved international connectivity and enhanced port growth. “2.56 The Government has concluded that there is a compelling need for an expanded network of SRFIs. It is important that SRFIs are located near the business markets they will serve – major urban centres, or groups of centres – and are linked to key supply chain routes. Given the locational requirements and the need for effective connections for both rail and road, the number of locations suitable for SRFIs will be limited, which will restrict the scope for developers to identify viable alternative sites. 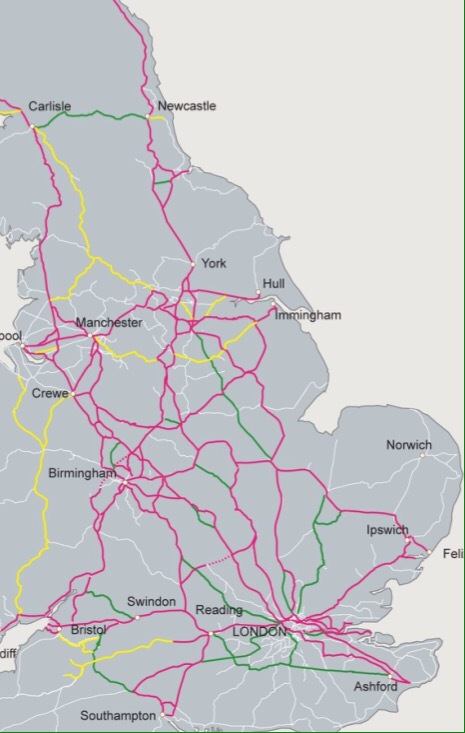 2.57 Existing operational SRFIs and other intermodal RFIs are situated predominantly in the Midlands and the North. Conversely, in London and the South East, away from the deep-sea ports, most intermodal RFI and rail-connected warehousing is on a small scale and/or poorly located in relation to the main urban areas. Currently it is down to the private sector to identify sites which may meet the NPS criteria, with a wary eye on what other sites may be in the frame – a game not for the faint-hearted, meaning a very limited pool of potential promoters. Will we see an amended National Networks NPS in the foreseeable future so as to give greater direction? I doubt it. “The central issue remains […] where to strike the balance between Green Belt and sustainable transport interests. The proposal would be inappropriate development in the Green Belt and would harm the openness of the Green Belt, at the same time there are positive aspects including some sustainable transport benefits”. “The Secretary of State continues to support the principle of encouraging more rail freight, but shares the Inspector’s judgement that the balance of benefits and disbenefits is against the LIFE scheme as currently proposed and that the general presumptions against inappropriate development in the Green Belt should apply”. Goodman are now promoting a smaller SRFI on part of the site. Their scheme is now imaginatively called SIFE (Slough International Freight Exchange) and was the subject of a planning application in September 2010. It was refused by Slough Borough Council and an inquiry was due to take place into Goodman’s appeal in October 2012. However, the inquiry was then put in the sidings whilst the then Secretary of State decided whether to re-open an inquiry into the Radlett SRFI scheme, which he considered might have significant implications for SIFE. As it happened, due to delays in that inquiry process (of which more later), the SIFE inquiry was not rescheduled until The Radlett decision letter was issued in July 2014. “24. The Secretary of State has carefully considered the Inspector’s reasoning about need at IR12.88 – 12.103 and accepts the Inspector’s conclusion that the current policy need for a regional network has not been overcome by the SRFI at Radlett and SIFE is able to be regarded as a complementary facility as part of a wider network (IR12.104). 25. With regard to the Inspector’s analysis of other developments and sites at IR 12.105 – 12.106, the Secretary of State agrees that the NPS makes clear that perpetuating the status quo, which means relying on existing operational rail freight interchanges, is not a viable option. “13. The Secretary of State agrees with the Inspector’s comments at IR12.8, and like the Inspector, concludes that the appeal proposal would be inappropriate development in the Green Belt and that it is harmful as such. As the proposal amounts to inappropriate development he considers that, in the absence of very special circumstances, it would conflict with national policies and with the CS. Like the Inspector, the Secretary of State considers that the NPS does not change the policy test for SRFI applications in the Green Belt or the substantial weight to be attached to the harm to the Green Belt (IR12.8). For the reasons given by the Inspector at IR12.9 – 12.11, the Secretary of State agrees with the Inspector’s conclusion (IR12.12) that the proposed development would result in a severe loss of openness. “40. The Secretary of State accepts that the most important benefit of the proposal is the potential contribution to building up a network of SRFIs in the London and South East region, reducing the unmet need and delivering national policy objectives. In addition, there is the prospect of SIFE being complementary to Radlett and other smaller SRFI developments and improving the geographical spread of these facilities round Greater London. In this context, the Secretary of State accepts that the contribution it would make to meeting unmet need is considerable. 41. He accepts too that SIFE would comply with the transport and location requirements for SRFIs to an overall very good standard. He acknowledges that sites suitable for SRFIs are scarce and the difficulty in finding sites in the London and South East region. On account of this factor, and the standard of compliance achieved, he affords meeting the site selection criteria significant weight. No less harmful alternative site has been identified in the West London market area, a factor which he affords considerable weight. Attracting less but nevertheless moderate weight are the economic benefits, the reduction in carbon emissions and improvements. But if the “need” for SRFIs is not allowed to amount to “very special circumstances” for the purposes of green belt policy, and if there is room for a balancing of the seriousness of that need as against the degree of harm that would be caused, does this lead to unnecessary uncertainty right until the conclusion of the decision making process? Couldn’t the suitability in principle of development in the green belt have been resolved at an earlier stage, preferably via the national policy statement? Similarly, the uncertainties as to the inter-relationship between the three schemes. Why was a decision on Radlett (positive or negative) allowed to become a prerequisite to determining SIFE? So what next for the site? As it happens, the proposed new runway at Heathrow Airport in combination with associated mitigation proposals and associated development would in fact take up most of the site in any event. Is this planning process now at least partly about establishing “no scheme world” value? Helioslough’s proposal for an SFRI on the former Radlett Aerodome site has a similarly lengthy – and even more convoluted – history. Two appeals had been dismissed for rail freight distribution proposals on the site, which again is in the green belt. The second appeal decision, dated 7 July 2010, turned on a conclusion by the Secretary of State that the Colnbrook site could be a less sensitive site than the Radlett site for an SRFI and that therefore “very special circumstances” for the development of the Radlett site had not been made out. Helioslough successfully challenged that decision. On 1 July 2011 HH Judge Milwyn Jarman QC ordered that the Secretary of State‟s decision be quashed, holding that the Secretary of State had misconstrued the Strategic Gap policy in Slough’s. Core Strategy and consequently had failed to treat that as an additional policy restraint over and above the Green Belt designation. So the appeal fell to be redetermined by the Secretary of State. Prior to redetermining it, the Secretary of State consulted with the parties as to whether to conjoin a re-opened inquiry with the inquiry that was to be held into the SIFE Colnbrook appeal. On 14 December 2012 he notified the parties that we was not going to re-open the inquiry but determine it on the basis of the evidence already before him. On 20 December 2012 he issued a letter indicating that he was minded to allow the appeal, subject to completion of a section 106 agreement. St Albans City and District Council sought to challenge by way of judicial review the Secretary of State’s decision to not to re-open the inquiry. However that challenge was refused permission by Patterson J on 14 June 2013 (and a subsequent renewal application before Collins J failed). As it happened, the “minded to grant subject to section 106 agreement” indication was unsatisfactory for the promoter too, which had problems completing a section 106 agreement due to land ownership difficulties (part of the site being owned by Hertfordshire County Council) which had led it to press for obligations to be secured by way of negative Grampian-style condition. Helioslough challenged the Secretary of State’s continued delay in issuing a final decision but permission to proceed with judicial review was rejected by John Howell QC sitting as a deputy judge on 1 July 2013. “In conclusion, the Secretary of State has found that the appeal proposal would be inappropriate development in the Green Belt and that, in addition, it would cause further harm through loss of openness and significant encroachment into the countryside. In addition the scheme would contribute to urban sprawl and it would cause some harm to the setting of St Albans. The Secretary of State has attributed substantial weight to the harm that would be caused to the Green Belt. In addition he has found that harms would also arise from the scheme’s adverse effects on landscape and on ecology and that the scheme conflicts with LP policies 104 and 106 in those respects. 53. The Secretary of State considers that the factors weighing in favour of the appeal include the need for SRFIs to serve London and the South East, to which he has attributed very considerable weight, and the lack of more appropriate alternative locations for an SRFI in the north west sector which would cause less harm to the Green Belt. He has also taken account of the local benefits of the proposals for a country park, improvements to footpaths and bridleways and the Park Street and Frogmore bypass. The Secretary of State considers that these considerations, taken together, clearly outweigh the harm to the Green Belt and the other harms he has identified including the harm in relation to landscape and ecology and amount to very special circumstances. Despite the Secretary of State’s conclusion that the scheme gives rise to conflict with LP policies 104 and 106, in the light of his finding that very special circumstances exist in this case he is satisfied that, overall the scheme is in overall accordance with the development plan”. Inevitably, the council challenged the decision. They asserted that the Secretary of State had applied too strict a test in considering whether he could depart from conclusions he had reached in his initial decision and that the Secretary of State failed to take into account a recent decision that he had made on a nearby site. The challenge failed: St Albans City and District Council v Secretary of State (Holgate J, 13 March 2015). So shouldn’t this be a scheme that is now proceeding, after all of that work? Reserved matters have been applied for, leading to local heat if a report of a recent planning committee is anything to go by. But the rub is that Hertfordshire County Council as land owner hasn’t made a decision as to whether to make its land available to enable the development to proceed. The third scheme is one in Crayford, again on green belt land, that was initially promoted by Prologis and secured planning permission on appeal in December 2007. However, due to the global financial crisis it did not proceed and the permission is now time expired. Roxhill has now replaced Prologis as developer and has submitted fresh applications for planning permission to London Borough of Bexley and to Dartford Borough Council (the proposed access road is in Dartford’s administrative area). Bexley members resolved to approve the scheme on 16 February 2017 but Dartford members resolved to reject it on 20 April 2017 following their officers’ recommendation. So presumably we may see yet another appeal. “28 Although London Plan policy 6.15a Strategic Rail Freight Interchanges is supportive of the type of facility proposed due to identified strategic need, policy 6.15b caveats this support and sets out criteria which must be delivered within the facility. A) The provision of strategic rail freight interchanges should be supported. Including enabling the potential of the Channel Tunnel Rail link to be exploited for freight serving London and the wider region. B) The facilities must: (a) deliver model shift from road to rail; (b) minimise any adverse impact on the wider transport network; (c) be well related to rail and road corridors capable of accommodating the anticipated level of freight movements; and (d) be well related to the proposed market. ”38 The need for a SRFI is accepted, and is borne out through the NPS, the London Plan and the Inspector’s decision on the 2007 case. The applicant has made a compelling ‘very special circumstances’ case but GLA officers would advise further clarification should be sought on the biodiversity benefits of the proposal and the environmental benefits, notably whether the emission savings and overall reduction in traffic movements are sufficient to justify the loss of Green Belt in line with London Plan policy 6.15 and supporting paragraph 6.50. It should be noted that TfL has raised concerns in respect of the potential impact on the passenger rail network and has suggested conditions to limit the hours of operation of rail movements in and out of the SRFI. GLA Officers would want to know the full details of the potential impacts on the wider transport network (in line with London Plan policy 6.15B (b) and whether such conditions would hinder the operation and whether this would reduce the potential emission savings and traffic movements. GLA officers would also seek details of the proposed biodiversity management plan and compensatory measures. GLA officers would also expect a similar obligations package as that previously agreed to encourage the take up of rail use. Even if your work never brings you into contact with the rail or logistic sectors, these convoluted stories must surely give rise to serious concerns. Successive governments have said that these types of facilities are needed in the public interest, for the sake of our national economy and to reduce polluting road freight miles. And yet they wash their hands of any responsibility for lack of delivery. The consequences of not providing clear strategic guidance is that years are spent on expensive, contentious planning processes. Often by the time that a process has concluded the world has moved on and the process has to start all over again. These are massively expensive schemes to promote. What can we do to make that investment worthwhile? If a site is unacceptable, can’t we indicate that at the outset and not many years later? To what extent should land ownership issues be resolved at the outset of a major project? Should the NSIP threshold be reduced? These schemes end up being determined at a national level anyway. Why not funnel them through a process that is more fit for purpose? Why don’t we bite the bullet and arrive at more spatially specific policies in the National Networks NPS rather than leave it for promoters to read between the lines as to what the Government’s approach may end up being to particular proposals – particularly given the inevitably sensitive locations involved, often in the green belt? (Or is that taboo issue the answer to my question?). (My apologies that this is so long!) Regarding the site on Howbury Farm (closer to Slade Green than most of Crayford). Noting firstly that a number of Bexley Councillors voting in favour of planning consent expressed objections and stated they were only voting in favour to avoid the Council having the expense of another Public Inquiry, the result if which they considered inevitable. Community objections to the new plans from Roxhill have so far centred on three things. One is that the ‘community benefits’ to balance the local impact are reduced compared to the earlier ProLogis plan – for instance, a plan to develop the ancient Tithe Barn close to the proposed site as an Environmental Studies Centre no longer appears, and plans to place neighbouring Crayford Marshes into a permanent trust are replaced with a plan to fund a 25 year plan for the marshes. Second is the impact of traffic (both direct and air pollution). Residents groups disbelieve the assumptions that the traffic projections are based on (noting air pollution projections are then based on the traffic projections). Air pollution (NO2) on the A206 Northend Road has been shown to be already above legal levels (both in testing by Bexley Council and by a local residents’ project). The applicant suggests that goods will be delivered by rail for local onward distribution to South East London and East London, yet argues that very little of the traffic generated will follow the A206 towards South East London (and past local housing), instead that nearly all of it will travel towards the M25 at Junction 1a. Residents groups believe a substantial proportion will head in the South East London direction, and even more so if new crossings of the River Thames in East London are given the go ahead. With the assumption of little traffic in this direction, there is no attempt at mitigation of traffic or air pollution in the areas residents are concerned about. The third area of concern is whether routes for freight will be available, and if they are, whether they will then prevent commuter services being expanded. Existing passenger services are already busy, there are plans for new services (Thameslink services from the Medway towns to Luton), and the community favours the extension of Crossrail through Slade Green (and on to Ebbsfleet and potentially the proposed Paramount Theme Park). Bexley Council’s recently-published draft strategic plan proposes substantial increases in housing over the next 30 years in the immediate vicinity of stations close to the proposed interchange – 8000 new homes in Slade Green, 1000 in Crayford, 6000 in Erith and 8000 in Belvedere, which the community believes will require a substantial increase in the quantity of rail passenger services required, and fears this will make the Rail Freight Interchange moribund, or that the Rail Freight Interchange will prevent passenger services from being increased. (These views are those of the poster and not necessarily those of the local community groups, and form part of information prepared for presentation at a community meeting in Slade Green on 19th June 2017). Finally, a very personal view – if these projects really were in the ‘National Interest’, they should not be left solely to developers who need to make a profit from them, and any detriment to the local community and to the Green Belt environment should be balanced by a substantial plan of mitigation supported by the national Government on behalf of the nation which is said to benefit from them. The term Strategic Rail Freight Interchange does not appear within the Planning Act 2008 (PA08). PA08 considers all such sites to be Rail Freight Interchanges (RFI), making a distinction in terms of scale and capacity to classify the larger sites as Nationally Significant Infrastructure Projects, thereby altering the approval process through the transfer of responsibility to the Planning Inspectorate. •	Is the use of rail freight optimised? •	Has rail trunk haul been maximised, e.g. in comparison to alternative sites? •	What elements of secondary distribution have been minimised? •	Is the proposal likely to reduce the cost to users of moving freight by rail? •	Will trip mileage of freight movements on both the national and local freight networks be reduced by the proposal? I put this to PINS recently and they responded that (a) there was no definition of an SRFI that had been tested by the courts and (b) that PINS had no standard set of tests that they used to assess the viability of and SRFI. If these tests are applied to the current crop of SRFI proposals in the Midlands, most fail. They are simply not close enough to the point of sale of the goods to minimise secondary distribution. Next Next post: NPPF Paras 49 & 14: So What Is The Supreme Court Really Saying?